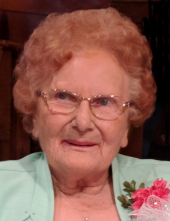 Mrs. Beatrice York “Bea” Hendricks, 87, passed away on Thursday, January 24, 2019, at the Baptist Health Hospital in Richmond. She was born in the Cartersville community of Garrard County on November 30, 1931 to the late Ulysses Grant and Nellie Rector York. In May of 1949 she married the late Mason Hendricks - they were tobacco farmers and “Bea” also worked at the Cowden Factory in Lancaster and Holiday Inn here in Richmond. In earlier years she loved going to yard sales, sewing, quilting, cooking and most of all attending church and spending time with her family. In the past few years she lived at The Terrace in Berea where she enjoyed the activities, especially Bingo. She attended the Richmond House of Prayer and often would attend the Full Gospel Tabernacle with Randy and Wanda – she loved all and they all loved her. Survivors include: her daughters, Judy Cornelison (John), and Wanda Nunley (Randy); grandchildren, Jay Cornelison (Sherri), Kay Funk (Trent), Michael Cornelison (Crystal), Jonathan Howard, Angie Holleran (Chris) and Josh Nunley; great-grandchildren, Skyler Floyd, Mason Howard, Ashlyn & Lauryn Funk, Taylor Holleran, Justin Cornelison (Kayla) and Randonn Howard; great-great-grandchildren, Abbi, Eli, Aaron and Christian; 1 sister, Pearl Kelley; a special sister-in-law, Betty York; many nieces and nephews whom she loved dearly. She shared a special friendship with Phyllis & Gary Risk as well as a exchange student who became like a granddaughter, Chastine “Melena” Lavoie. “Bea” was also survived by her best friend, a 14 year old Yorkie named Max. In addition to her parents and husband, she was preceded in death by 12 brothers and sisters, Viola Conn, Emma Kelly, Mary Rhodus, Ella Mae Bolton, Dolly Powell, Janie Creech Ray, John York, Lewis “Doc” York, Tommy York, George York and Sam York and one granddaughter, Laci Dale Nunley. Funeral Services will be conducted at 2:30 PM Monday, January 28, 2019, at the Combs, Parsons & Collins Funeral Home, W. Main St., Richmond, with Bro. Owen Moody and Pastor Ricky Horn and Bro. Scott Guiley officiating. Burial will follow in the Richmond Cemetery. Visitation will be from 3:00 – 8:00 PM Sunday evening, at the funeral home. Honorary Pallbearers will be: David Bolton, Jason Bolton, Lloyd Baker, Justin Cornelison, Gary Risk, Bobby Shepherd, Carl York, Harold Lane, Larry Powell, Bud York, Johnny Todd and Johnny Lancaster. "Email Address" would like to share the life celebration of Beatrice "Bea" Hendricks. Click on the "link" to go to share a favorite memory or leave a condolence message for the family.